We are pleased to present our next exciting sale. The Hunt for October Auction starts October 24th at 6:00 pm (EST). This sale offers an assortment of unique and intriguing pieces from pertinent local collections. Our remarkable assortment of Mantiques and rare collectible items offer something for everyone. Featuring Tiffany, Steuben, Lalique & much more fine art glass. 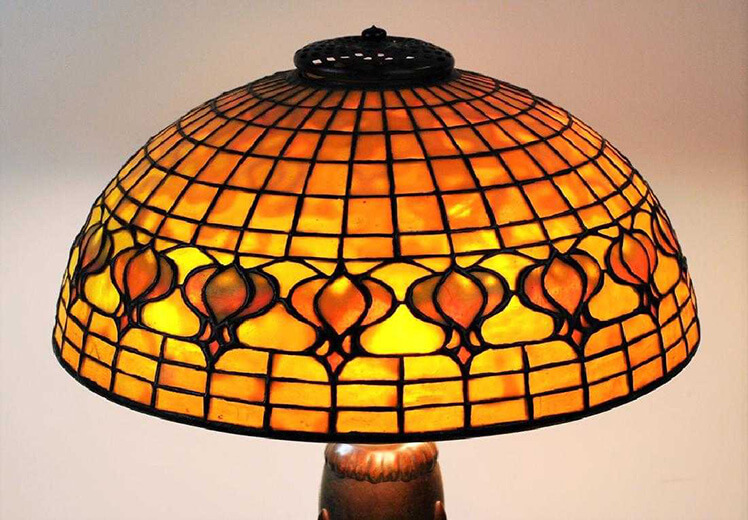 The first lot in this auction is a Tiffany Studios Leaded Glass Geometric Table Lamp, estimated between $8,000 – $12,000. This is a fine example of Tiffany leaded glass displaying a beautiful array of color while retaining the original patinated base. Lot #51 is an authentic CHANEL handbag crafted of fine black Caviar leather, finished with gold hardware and deep burgundy lambskin interior. This timeless bag retails for over $5,000. Don’t miss your chance to own this fantastic handbag for a fraction of the original price. Lot #196 features a vintage Heuer Pasadena sport model chronograph wristwatch. It is in good condition and includes market strap and metal buckle. If you’re looking for that true retro eye catcher this is the watch for you. Estimated to sell between $1,800 – $2,200. Lot #52 is another unusual must have accessory item. This Navajo American Indian 14k gold Turquoise bracelet is estimated between $1,500 – $3,000 and is crafted by artist Larry Pinto. He is a Navajo silversmith that has been making beautiful jewelry since his youth. He hand-finishes his creations and is a master jewelry artisan. Lot #129 is an amazingly charming 43-piece Miniature Silver Furniture Antique Diorama Set. This handcrafted interior diorama scene is estimated between $400 – $800. This unique antique wood miniature room is decorated with many miniature dollhouse accessories, of which 37 are silver. Adorned with an electrified chandelier, carpets, wooden dressers and desks, and even porcelain plaques are just a few of the features in this tiny room. Lot #157 is an Imperial Coronation Limited Edition Faberge Egg with Carriage. This fine enamel egg-form box is studded with white rhinestones and is glazed with guilloche and yellow enamel. It opens to reveal a miniature red enamel carriage. Maude Sherwood Jewett (1873-1953) American, known for her sculptural works. Two Dancers featured in Lot #244. Estimated $3,000 – $6,000. weight is 105 grams, estimated between $800 – $1,200. This piece a rare estate find fresh to the market. Lot #250 features a large antique Royal Doulton Morrisian Jardiniere planter that is estimated to sell between $600 – $900. It is decorated with William Morris decoration with pastiches throughout from William Bradley of golfers. Lot #425 is a signed Muhammad Ali (1942 – 2016) genuine boxing head gear accompanied with a COA from JSA. Muhammad Ali was not only a world champion boxer, he was a philanthropist and an activist. This item is an amazing piece of boxing history and is estimated to sell between $100 – $1,000. Find items like these and so many others with Hill Auction Gallery in our Hunt for October auction.